A party of 35 people, plus Mike Sheppard, our guide, left Stapleford at 7.15am and headed for Dover. Apart from a slight hold up on the M11 we made good time to Dover and caught the 11.10am ferry to Calais. We arrived in Calais at 1.25pm (French time) and headed for our first cemetery. 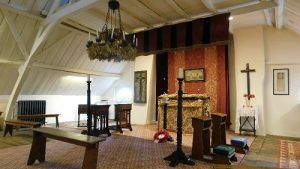 Talbot House: In the heart of Poperinge, two army chaplains, Neville Talbot and Philip ‘Tubby’ Clayton opened a club, from December 1915 onwards, and for more than three years, to provide rest and recreation for all soldiers, regardless of their rank. (This house is also known as TOC H). Brandhoek New Military cemetery: Here we saw the grave of Captain Chavasse of the Royal Medical Corps who had won two VCs. Menin Gate: 8.00pm the last post ceremony. Many people there and after the last post had been played a band played whilst groups of three (mostly young people) laid wreaths. There are over 55,000 names on the walls of the gate. They are the names of the soldiers whose bodies were never found or identified. On the way out of Ypres in the morning we went by a roundabout, ‘Hellfire Corner’, which was the furthest point the Germans had got to and there was a small stone with a ‘tommy’ helmet on it. 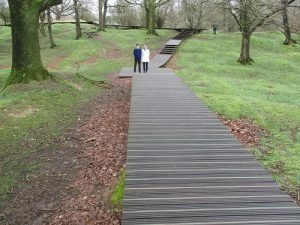 Hill 62: Is a war memorial that commemorates the Canadian corps who defended stretches of the Salient between April and August 1916. Santuary Wood cemetery: There was a small museum here and the remains of some of the trenches. New trees had been planted, but quite a tall trunk of one of the original trees had been left and you could see all the bullet and shell holes. Tyne Cot cemetery: This is the largest cemetery in the world where there are over 11,908 graves. Stopped off briefly at Vancouver Corner to see the memorial to the brooding soldier. We returned to the hotel for lunch, but most of the group were dropped off in the centre of Ypres so that we could visit the cathedral and Flanders Museum. 2.30pm We were picked up at the cathedral and on our way out of Ypres we passed the Guynemer Memorial at Poelkappelle. On top of this memorial is a stork which is shown flying in the direction that Col.Guynemer was going when he was shot down. Langemark Deutschen Soldatenfriedhof: The German military cemetery. So different from the English cemetery. There are no head stones just grey slabs on the ground, some with names on and under the names a number for unknown soldiers also in the grave. There was an area about the size of a tennis court where 24,000 German bodies are buried standing up as there was no room for them. There are large head stones around the edge with the names of the soldiers on them. There were some poppy wreaths here, but these had been laid by English people as Germans do not accept the poppy. There are over 44,000 burials here. Saw a memorial unveiled by Harry Patch on 20 September 2008, who died aged 111. Boezinge Little Bertha – We saw a gun on top of a hedge and a demarcation stone. Essex Farm Cemetery: A medical clearing centre. Col. McCrae was a Canadian surgeon and he wrote the poem ‘In Flanders Fields’. We saw the grave of V J Strudwick aged 15 years. Returned to the hotel at the end of day 2. Left Ypres by the Lille Gate on a cold and windy morning. We saw Messines church in the distance and this is where Hitler was nursed in the crypt. There are paintings in the church that he did. We passed the Irish Peace Tower. 16 year old Albert French is buried. Churchill served in this area in 1916. Vimy Ridge Canadian National Memorial and Museum on Hill 145: Over 11,000 Canadians died in the war. The memorial here was dedicated by King Edward V111 in July 1936, it was the only overseas event he attended. At the visitors centre there was mock ups of the trenches. On route we stopped off at Roclincourt cemetery where Janet Johnson’s great Uncle is buried. All the graves are 1918. We did a complete circular tour of the park. There was a memorial there to the 51st Highland division. Within the park there are several cemeteries. The Hunters Circular cemetery is where they are buried in a shell hole. In the Y Ravine cemetery all the dates on the graves are 1st July 1918. This is because there were mines set up to all explode at the same time and the one here went off early and alerted the Germans, which meant they gained the high ground. Hawthorn Ridge cemetery is there. We passed the Ulster Tower and there are two Irish cemeteries nearby. Thiepval Memorial to the Missing: There are 16 pillars here which makes 64 faces and there are 12,000 names on each face. It was designed by Sir Edward Lutyens. As you look out on the cemetery from the top of the memorial the French crosses are on the left and the British stones on the right. Lochnagar Crater: This is a massive crater and measures 90 metres in diameter and 20 metres in depth. The crater was bought by Richard Dunning in 1978 and he maintains it in memory of all those who died in the area. Our last stop was Les Boeufs Cemetery where Dorothy Ward’s uncle was buried. We then headed for Calais and our 7.55pm ferry. On Tuesday April 3rd we set off from Stapleford, 36 of us in a Richmonds coach,for a three day excursion to the Ypres Salient and the battlefields of the Somme. The Stapleford History Society supported the idea and most travellers are members of the society. I was encouraged by the interest shown and we filled the coach with some friends from Sawston and Shelford. and.Belgium. I was very lucky that he agreed to lead our tour and suggest a driver who had worked with him before on a similar trip. Together they were a great team and we had an incident free, very informative and comfortable journey. Most of us were of a certain age with grandparents or parents alive in the early twentieth century. Several participants had a personal mission and were seeking a particular grave in a particular cemetery. Finding a relatives headstone is an emotional experience which we all appreciated. Our trip was not all cemeteries and memorials although the enormity of the loss was never far from our minds. We visited Talbot House which was a haven for many traumatised soldiers. We saw trenches, the incredible closeness of the front lines of battle, the craters, the Menin Gate ceremony, the seemingly endless lines of headstones, the immaculate places of rest for the thousands who died, the lists of names of all those with no known grave. We marvelled at the dedication of soldiers of the Commonwealth, then the British Empire who came from across the world to fight in Europe.. We visited a German cemetery,so very different but marking the loss of thousands of young German men. So poignant .We appreciated the care of the Commonwealth War Graves Commission for the tranquillity and immaculate appearance of every cemetery, be it large or small. We stayed two nights in the very comfortable hotel in Ypres , the Ariane, and had time to explore this interesting town. It is hard to believe that every building including the magnificent cathedral, less than a hundred years old. We had excellent food, enjoyed a few drinks, bought our Belgian chocolates and shared our thoughts and mixed emotions about our world today, the huge loss of life and the futility of war. Organising this trip would not have been possible without my right hand woman, Wendy Brown, who is a great support and friend. When I asked her to help she didn’t know what it would entail!I I also realise how fortunate we were to have a party of like minded people, who were reflective, responsive and empathetic. Since our return we have tried to illustrate the impact of the experience with thoughts and pictures. On 11th December 1915 the house at number 43 Gasthuisstraat (at that time the street was called by its French name – Rue de l’Hôpital) opened its doors for the first time, welcoming British soldiers to a new club. The large house was owned by a wealthy brewer, Monsieur Coevoet Camerlynck. In the early summer of 1915 some German shrapnel shells had landed in the garden and damaged the rear of the house. Having removed his family and all his belongings M. Camerlynck was pleased to offer the empty house for rent to the British Army for 150 Francs a month. An Army Chaplain the Reverend Philip “Tubby” Clayton saw a use for the property as a soldier’s club. It became a rare place where soldiers could meet and relax regardless of rank, an Every-Man’s Club. I am told this epitaph would have been chosen by his family. Standing at his graveside 100 years on, I felt a keen sense of sadness and deep empathy for our family and their loss. Congratulations to you both on arranging such a most enjoyable and successful tour of the War Graves of Belgium and France. Both Jo and I felt the tour ran like clockwork, due in no small measure to the detailed preparations made by you both prior to our visit. Our hotel was excellent, Mike our tour guide so knowledgeable and information and our most competent and humorous driver Keith. The number and variety of the sites we visited was very moving and impressive as well as being highly emotional. I feel privileged to have been given the opportunity to pay my respects to so many brave young men. My late father served with the Expeditionary Force in the second world war and survived Dunkirk. At times I felt I was walking were he might have trod particularly when visiting Talbot House as he was a member of To H and spoke very highly of Tubby Clayton the Chaplain. 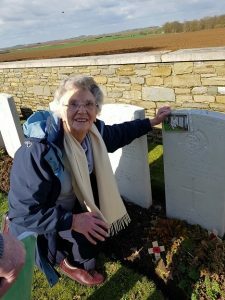 For me the icing on the cake was being able to lay my cross on my Mother’s brother’s commemorative headstone in the cemetery at Lesboeufs – and I do so appreciate the detour being made to make this possible. I know Jo also was moved to have the opportunity to lay her cross too in dedication to a great uncle who served in the Great War. Once again Wendy my sincere thanks to you and Wendy Brown. You both deserve our love and thanks. Dear Wendy – I feel very privileged to have had the opportunity to join you all our the trip. I echo all Mums comments and would like to say a huge thank you for making me so welcome. 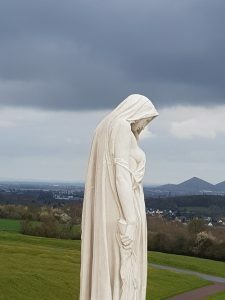 I think the Canadian memorial will stick in my memory for years to come – the statue was very moving and thought provoking. 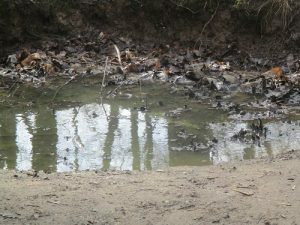 Mud – just seeing how the water was lying on the muddy fields in 2018 made it so much easier to understand the mud of the trenches. 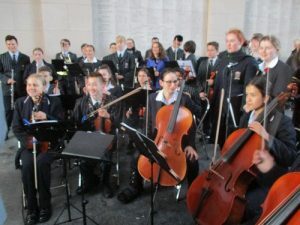 The Menin gate – The commemoration on 4th April 2018 was the 31,000th time this act of remembrance had been held. British scouts lined up under one arch. 7 out of the regular 8 buglers played the Last Post, an Australian dignitary read the citation, a lament was played on the bagpipes, an orchestra and choir from Melbourne, Australia performed the ‘Pie Jesu’from Fauré’s Requiem while the wreaths were laid, and an RAF cadet band played and marched out at the end. One of the wreaths was laid by a young boy, aged about 9, wearing his relative’s medals and on the wreath was written ‘In memory of my great, great, great uncle.’ The mayor of Ypres and other dignitaries shook hands with all the organisers at the end. Many of the grave stones have words carved on them like ‘He died nobly for his country’ but one of the most moving comments was from a fiancée expressing her anger that she was left with nothing but her memories. 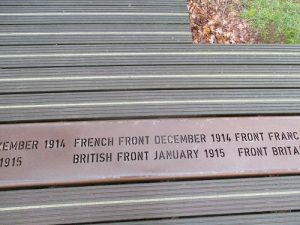 One of the most shocking moments was walking round the boardwalk at Hill 60 and coming across a marker showing the German frontline in January 1916 with the British frontline only 16 metres further on. The soldiers could have chatted to each other. Wendy and Chris standing on the German front line and photo being taken from the French front line. “We entered the Langemark Cemetery through a reception building resembling a black box, just after a heavy shower of rain had passed and a rainbow showed over the dark sky. Alongside ran a water filled ditch, wisteria, not yet out, scrambled along the wall. In stark contrast to the white gravestones of the CWG here the headstones lay flat on the ground, made out of black basalt carrying multiple names as up to 8 soldiers were buried in each grave. Here 10,143 soldiers are buried, oak trees, the nation tree of Germany, interspersed amongst the graves and symbolic groups of crosses were scattered across the ground with remains of three bunkers. Near the entrance, about the size of a tennis court, a mass grave with 24,917 German servicemen in a mass grave, known as the comrade’s grave. Around it panels engraved with names. 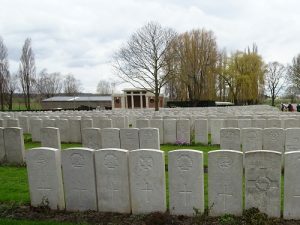 Sometimes it is known as the ‘students’ cemetery’ as around 3,000 students and apprentices died on the first day of fighting after just 6 weeks training. Regiments of remembrance under skittish skies in foreign fields. Each a memorial to the insanity of battle and the immensity of sacrifice. At our first stop at the Brandhoek New Military Cemetery I was horrified at the number of graves, thinking nothing could be worse to see. How wrong I was. It wasn’t just the large cemeteries that moved me it was seeing the distance between the German and French/English front lines at Hill 60, just 16 metres, between December 1914 and January 1915, the trenches at Sanctuary Wood and the small Y Ravine Cemetery in Newfoundland Park where all the graves were dated 1st July 1918. Then there was the stark contrast at the German Cemetery, Langemark Deutschen Soldtenfriedhof, I’m sure the German soldiers didn’t want to be in a war anymore than our soldiers did. Seeing graves of young men still in their teens, who went into the war expecting it to be over by Christmas, was so upsetting. It could have been my grandsons. What a waste of lives. Has the world learn from this? I don’t think so. The group has just returned from a memorable three days visiting numerous battlefield sites, cemeteries and memorials in Belgium and Northern France. Some locations were small and quiet, others were larger sites whose names may be equally familiar to those who’ve never visited as well as to those who have. The Menin Gate is one such. At the Last Post ceremony each night crowds gather to be part of an ongoing and poignant act of remembrance. On the evening when we attended, I was struck by the number of young people present amongst the dense crowd. Young people not only spectating but also taking part, with visible respect and pride, in wreath laying and as visiting band members. At many other points on our trip, we encountered visiting school parties and family groups with children. Young Canadians staff the Canadian National Memorial site at Vimy Ridge; there is written evidence, on wreaths placed at various cemeteries, that organised groups of young people are continuing to seek out the resting places of those who had once attended their school or had been members of their particular youth organisation. In such contexts, the remembrance exemplified by these young people feels fittingly vibrant, positive and highly appropriate. There may be no more important legacy than that each succeeding generation continues to reflect on the sacrifice, which bequeaths to it the freedom to live. Here is my memorable sight/moment. The Lochnagar crater is described in many books because of its effect on all those who witnessed it. Even a hundred years later it it is the most enormous hole in the ground created by British tunnellers who exploded 60 000 pound of ammonal under a German occupied hill which had commanding views over the surrounding countryside. The 1st July marked the beginning of the battle of the Somme and a series of mines were exploded under German positions but Lochnagar was the biggest. Immediately the mines were exploded and the gunfire stopped the British and Empire troops advanced. In that first morning 30 00 soldiers were killed or wounded. There is a board walk around the rim of the crater and a third of the way round I went down a muddy slope to look at a descriptive board. I didn’t have my camera so this is from memory. The board had a photo of ‘Billy’ Disbry from Barton in Cambridgeshire which said that Billy had joined the ‘Cambridgeshire Pals Battalion” which was the 11th battalion of the Suffolk Regiment and after the end of the barrage the battalion advanced on the German positions. The Germans on the hill had been blown to pieces and it was captured but on either flank the Germans emerged from very deep bunkers, set up their machine guns and fired into the exposed Allied troops. Billy was one of the soldiers killed that morning. Of all the soldiers who took part in the battle that morning it was a surprise to find a description of a soldier who lived in a village so close to Stapleford. perhaps some of the men from Stapleford were in the same Pals Battalion. It is a job to know where to start…. Perhaps by mentioning that my Grammar School history syllabus for the School cert ended at those two revolutions viz: The Agricultural and the Industrial. My father who was wounded at St Quintin in 1917, and Janets father also in a Somme battle, would not talk about their experiences in the trenches. Fortunately both lived “Not to Tell” the tale!! With some limited background knowledge, eg the Lochnagar mine and the Thiepval memorial, I found this whole trip really mind blowing. As we came across cemetery after cemetery, and one heard mention of in excess of one thousand cemeteries that whole war process really struck home. Two other small facets enlightened me also. The fact that there were Indian troops in the campaign was illustrated by some of the “periscope” type pictures in the little museum at the visitor centre at Sanctuary wood. These pictures showed “Sikh” soldiers marching with their weapons and pulling small artillery pieces. Also I was surprised to learn of the independence of troops from Newfoundland who did not want to be part of the Canadian input but were formed and battled under their own officers. but as part of the British army!!. As Janet has commented more than once, how taken she was by the pristine green nature of the cemeteries and their meticulous upkeep. 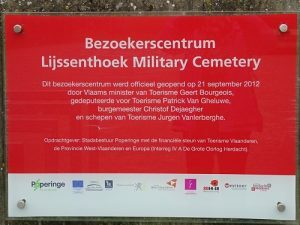 A credit to the War Graves Commission. 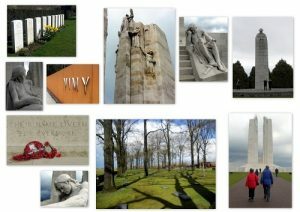 “Our trip to Ypres was a thought provoking experience for us. We left Stapleford at 7.15am and crossed the channel with ease. I think the first cemetery we came to made the biggest impression for me because I hadn’t seen one before located at the actual site of warfare. The headstones of young men, some with their names on and some Known unto God engraved, it was very touching. Also the whole cemetery was so beautiful too, the white clean headstones, the green trimmed grass, flowers and shrubs so well looked after. It was a place of serenity and a place that after the horror of fighting in such atrocious conditions the young men were now resting in a peaceful beautiful place. All the following cemeteries had the same atmosphere too. The weather was such that the fields were so wet and muddy-we could imagine the conditions the soldiers had to contend with. 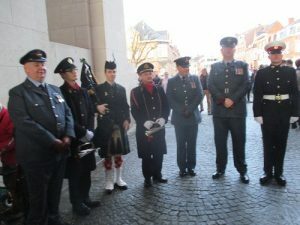 Another memorable occasion was the service at the Menin Gate. Although it was very crowded and we couldn’t see a lot of what was going on we could hear and sense the solemnity of the Last Post service that occurs every single evening at 8pm. What a tribute to the departed. David and I walked around at an earlier time when all was quiet and saw the poppy wreaths and beautiful fresh flowers adorning the steps. 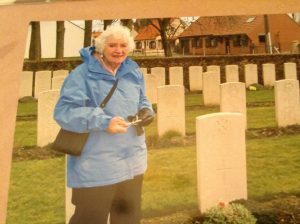 Although we went to the large Tyne Cot Cemetery I liked the smaller and somewhat intimate cemeteries, like Roclincourt Cemetery where Janet found her relative’s grave. The sun even came out briefly there. At Tyne Cot Cemetery we surprisingly found an F. Pepperell inscribed on the wall (with the same spelling too!). See photo below One of our last stops was Lochnagar Crater the largest of 17 mines that exploded on 1st July 1916. Debris from the explosion rose some 4,000ft into the air. It made the loudest man-made sound in history. The mine created a crater 91 metres across and 21 metres deep, including a lip 4.6 metres high. It was very impressive. David walked all around and nearly missed the coach! He could have stayed longer there. We thoroughly enjoyed our visit and thank Wendy E for thinking of the idea, and both Wendys for organising, Mike for leading and Kevin our coach driver for our safe journey there and back”.